Many thank to all of you for your patience this summer. BIG changes have been instituted here at The Manse. The children are old enough to attend summer camps, but not old enough to drive themselves there. I have a very nicely tailored chauffeur’s uniform, rest assured. The biggest change has been in our exercise habits. I say “our” because Mrs. E. and I have undertaken the P90X course. Yikes. But, with the exception of a severely bruised hand and a bruised or broken toe, we’re chugging along nicely. It always helps to have a partner to spur you along when you’d rather be drinking an iced tea on the veranda. Oh yes, we have a veranda. Well, a porch at any rate. A double back porch to be more specific. It’s being painted now, replete with the classic Southern blue ceiling that either keeps away the bugs or mimics the sky that you’ve just paid an awful lot of money to have blocked out, depending on your source of information. I’ll post some photos when we get the furniture in. It’ll be smoke black “wicker”. After the construction site that is the backyard is finally cleaned up, we’ll have to tackle the reworking of the garden; “it’s dead, Jim,” to quote old Bones McCoy. I’m not sure that August will be the best time to plant. July has been sort of unbearable, the last two days excepted. This sort of heat and humidity has me relegated to the seersucker or linen trouser and an open shirt. It’s just been beastly out. 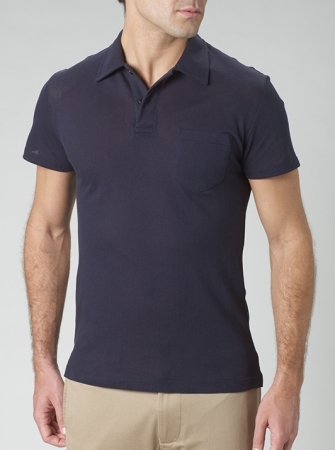 I have, however, discovered my new favorite polo shirt: Sunspel’s Riviera Shirt. It is the same worn by Daniel Craig in “Casino Royale.” The genius here is the open mesh weave. And I mean open, you can see through it until you put it on. Bring on the tropical breezes, say I! Sunspel was also responsible for putting Sean Connery into his blue bathing trunks for “Dr. No.” As much as I dislike encouraging competition and lessening my chances to win, please enter Sunspel’s Designing James Bond contest. You’ll be eligible to win the flight of colors of the Riviera shirt, the remade blue trunks and another pair of recreational shorts. If you’re going casual, you may as well be casually well-dressed. Back in a bit and thanks again for bearing with me. This entry was posted in Elegantology, Living and tagged Bones McCoy, Daniel Craig, Dr. No. Casino Royale, P90X, Riviera Shirt, Sean Connery, Sunspel. Bookmark the permalink. 4 Responses to Xtreme Patience. I do believe planting in your area would be early fall or early spring. The heat of the summer, especially this summer, may cause you to lose a few. And, I mean plants not pounds as your P90X will take care of that. A noble and worthy effort! Just reading P90X makes me tired. Can’t wait to see the porch and do miss your occasional recipes, tables, parties, etc.! Your P90X endeavor is noteworthy and a great example for the rest of us. Good for you. I do want to say though, I look forward to your emails and I miss them when they do not arrive. I hope you have a great summer my friend.